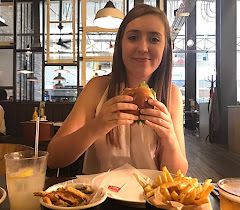 When I received an invite in my mailbox to take a trip over to Revolution in Derby for a mini cocktail masterclass and some food from their new menu, I was so excited! After the masterclass that I took part in next door at Revolucion De Cuba, I couldn't wait to give it another try with some new drinks and when there's food involved too - I'm there! We'd arranged to visit at 6pm on a Friday evening - it was really quiet with just another group of girls having drinks so can see why it was the perfect time to get me in to avoid a busy rush. Upon arrival, we were taken over to the left side of the bar where their specially trained mixologists show and teach you how to make your own cocktails! I told the guy from the beginning that I don't drink alcohol but he assured me that there were plenty of mocktails that could be made instead. As well as a newly launched food menu, the drinks menu has been updated too in the run up to summer meaning that the choice of drinks that we could make was huge! We were able to pick what we wanted to make and we got cracking. I had so much fun making my drinks - I made one with alcohol in to begin with which was a classic Cosmopolitan (Emily ended up drinking it) and then a mocktail (above) called Naked Sunset which was delicious. It's full of fruity flavours such as Mango & Passionfruit finished with a dash of lemonade for that slight sparkle. Emily had a great time too making (and consuming) the drinks. She made a Vodka Martini to start which contains purely alcohol - no watering down in that drink. She did like it, but was far too strong for someone driving back. Next up for her was It's a Rum Ting. Creating this cocktail involves pouring out some of the can of Ting, mixing together with a combination of Rums (one banana flavoured), Cointreau for the Orange flavour before carefully straining back into the original can and garnishing. After completing our mini masterclass, we took a seat in the bar and had a look over the new menu whilst waiting for a sharing Mezze Board to be bought over. These Mezze Boards make a great sharing starter or even just for nibbles. It comprises of crispy Tortilla Chips, Skewered Chicken, Slices of Chorizo, Houmous, Goats Cheese Bon Bons, Garlic Bread and Guacamole. This went down a treat, both of us loving the garlic bread in particular! We soon realised that we were hungrier than we thought, so decided to go ahead an order a light main course each. A Fish Finger Sandwich for Emily and a Southern Fried Chicken Wrap for me. Now, these don't come with fries automatically, so we ordered two portions of those too. In all honesty, they didn't look amazing. Beige. However, the skin on fries were very tasty/ crispy. Nothing else to say really other than it was food! Nothing amazing, nothing terrible. If I was to have food here again, I'd make sure it was on a Monday as they do 50% off. I'd be more willing to pay that than full price any other day. Speaking of deals, if you head to Revolution for Lunch during the week, they guarantee that your meal will be served in 15 minutes or less, or you get your money back! Perfect for your work's lunch break if you fancy something different to your cucumber sandwiches. With so many Revolution bars up and down the country, I'm sure you'll never be too far away from one when you fancy stopping by. In the mean time, take a look at their website here.